ike Inveraray and Kenmore, this is a company town owned and created by the great man in the nearby castle which, in its Victorian incarnation, sits like a great wedding cake on the north side of Strathgarry. Cummings Tower lying at the heart of the modern castle was erected about 1269 by John Comyn of Badenoch when David, the crusader earl of Atholl, was in England. At one time the Comyns were the most powerful family in the land and claimants for the Scottish crown, fighting against Edward I when Bruce was still the English king's ally. In the squabbles between Norman immigrant barons for the throne, Robert Bruce murdered the Red Comyn in front of the altar of the Franciscan Priory of Dumfries. Seeking vengeance, his son fought and died on the losing side at Bannockburn and, since winners write history, the family disappeared. Blair Castle was 'destroyed with powder' by one of Cromwell's colonels in 1653. Yet it lay at the heart of the Rebellion of 1689 and in 1746 endured the last siege in British history when the duke's brother Lord George Murray spent a leisurely few days bombarding it and its government garrison. As major players in national politics, the dukes were forced to spend increasing amounts of time in London after the Union and, in 1771, a ducal mansion was built in Grosvenor Street. 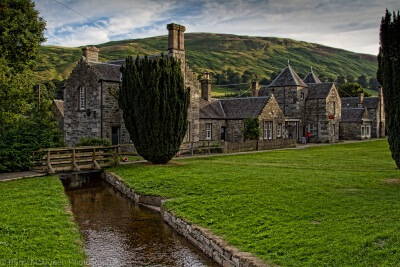 In spite of owning the Isle of Man and coal mines in the Lowlands, the bulk of the duke's interests were in the Highlands and these could not generate sufficient cash for him to compete comfortably with his peers. In Atholl he sold off lands to the resident lairds but retained ownership of a hundred and forty thousand acres. By the twentieth century, taxation and the world depression put the entire estate in jeopardy and it was saved by being bought by the mother of the bachelor 10th duke, a member of the Cowdray/Pearson family. On his death in 1996, the title was inherited by a South African kinsman descended from the 4th duke and the core of the estate was passed into the ownership of a Trust whose duty it is to preserve the landscape in perpetuity for the people of Scotland. The link between the dukes and the castle has not been lost. The vogue for the Garb of Old Gaul, as the Victorians called the kilt and its accoutrements, was enthusiastically followed by the Atholl family. In 1822, four officers, four sergeants and ninety six men volunteered to dress up in tartan and parade in the duke's tail when George IV came to Edinburgh. His Grace decided that the enormous Highland input to 'The King's Jaunt' was rather vulgar and left them at home but they paraded at the local Highland games in 1824. A full contingent, in spanking new uniforms, turned out to march with the new duke down to the Eglinton Tournament in 1838. On this occasion the aristocracy of Scotland put on fancy dress and played at Ivanhoe in the pouring rain. After that the Highlanders regularly turned out to greet and guard his Grace's most important guests. These estate workers, decked in claymores with pipes to the fore, so amused Queen Victoria that she awarded them their colours, making them the only private regiment of the British army. The regiment still exists, enjoyed as a hobby by those associated with the castle and the estates. It is the duke's regiment, not the castle's, and he comes over to this country to meet them and they go to South Africa to meet him. Much whisky is drunk. The castle grounds are remarkable for their specimen trees and the reception rooms were remodelled during the eighteenth century and this is how they are laid out today with the lavishness one would expect from one of the great potentates of the Highlands. Much of the rest retains the atmosphere of a grand country house of the Victorian and Edwardian eras. Of special interest are the mementos of the century of the family's involvement with Jacobitism and the oddities and antiquities gleaned from the countryside by the local people and presented to the dukes for safekeeping.